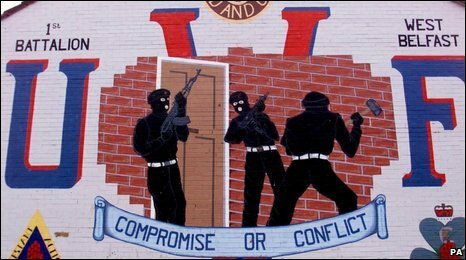 Three loyalist paramilitary groups in NI have decommissioned weapons. It is understood the most comprehensive move was by the UVF, but the UDA and Red Hand Commando are also believed to have put some of their guns beyond use. The moves follow months of increasing pressure from the government, and secret talks amongst loyalist groups. The government was told of the UVF move by General John de Chastelain, head of the Independent International Commission on Decommissioning (IICD). It is understood General de Chastelain and a number of independent witnesses watched the act of UVF decommissioning in the past week. The UVF is understood to have put a "significant" quantity of weapons beyond use. General de Chastelain is believed to have briefed the Northern Ireland Office on what happened. "The only people who know exactly what was decommissioned by the UVF are its leadership, the general and his team and those eyewitnesses. "I understand the general has a statement ready, but they can't issue it until authorised to do so by the UVF leadership." "As for the largest loyalist group, the UDA, my understanding is that it has also started the process of decommissioning - but that its move wasn't anything like as comprehensive as that of the UVF. "But the fact that it has started the process is regarded as highly significant - and the government will hope it's a process that will continue." Four years ago the IRA put its weapons beyond use in decommissioning witnessed by two churchmen. The latest decommissioning comes ahead of Secretary of State Shaun Woodward's August deadline for significant progress on loyalist arms. Mr Woodward said if loyalist decommissioning was confirmed, it would show that politics in Northern Ireland was working. He said it would vindicate his decision to persevere with the decommissioning scheme rather than listening to those who had argued he should give up and not renew the relevant legislation. Chief Constable Sir Hugh Orde said the move was "good news" which he thought was "very significant". The commission said it "expected to be reporting to the government at the end of August". 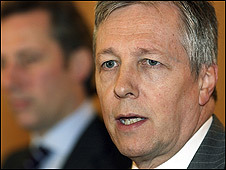 Northern Ireland's First Minister Peter Robinson said any move by loyalists towards decommissioning would be "welcome". "Over the last nine months the DUP has been engaged in ongoing discussions with both the UDA and UVF leaderships," he said. "The objective of the discussions has been to assist the organisations' transformation from paramilitary organisations into people who are playing their full part in a peaceful and democratic Northern Ireland with violence and criminality being firmly a thing of the past." He said they were aware the groups had been engaging with the IICD, but said they did "not want to pre-empt the outcome of this process". Sinn Fein's Gerry Kelly said that if the news proved to be true, his party would welcome it. "It is also important that other armed organisations go down this road," he said. "Politics is now working and there is no basis for any organisation holding onto arms." Leader of the UVF-linked Progressive Unionist Party (PUP) Dawn Purvis said she was not able to confirm decommissioning had taken place. She said, however, that loyalists had been involved in ongoing contacts with the IICD. "That is to be welcomed," she said. "That is where the process of decommissioning has to be dealt with." The UVF was formed in 1966 and is believed to have murdered more than 500 people during the Troubles. In 2007 it declared that it was renouncing violence. The UVF announced just over two years that it had put its weapons beyond the reach of its membership.